I sat in my room in the temple building in Skopje, the capital of Macedonia, taking prasadam and listening to a bhajan by devotees downstairs in the temple itself. "That's such a sweet bhajan," I said to a devotee, "and it's been going on for hours." "Yes, Maharaja," he said. "The Macedonians are very musically inclined. We love to sing and play musical instruments. We even have our own form of a tamboura here, a four-stringed instrument. Devotees use it often in bhajans." Two hours later I left for the square in the city center with a group of twenty devotees. The square, renovated in recent years, is a popular place for the people of Skopje to spend warm summer evenings sitting, talking, and eating in nearby restaurants. As we approached the square I saw the huge statue of Alexander the Great. "That statue is quite impressive," I said to a devotee. "Yes," he replied. "Alexander the Great was from Macedonia. He left here to conquer the world. He built a huge empire, but it was too much to manage, and he never returned home." "Srila Prabhupada actually said that Alexander the Great could not maintain his large empire," I said. "Srila Prabhupada said it was for this reason that he was emphasizing the importance of book selling over opening temples. He said, 'Don't make me Alexander the Great in my lifetime. People have recognized I am great. Don't make me small.' "
The devotee, pointed to the other side of the square. "There's also another important landmark over there," he said. "It's the home of Mother Teresa, who was born here in 1910 and left at seventeen to go to India as a missionary. The house is now a national memorial." As we walked closer I noticed a large crowd around the house. "Macedo-nians are honoring the anniversary of her departure today," the devotee said. "Let's take a look at it while devotees are setting up the bhajan," I said. "It was true to the spirit of a missionary's life,a life I had also chosen by taking sannyasa, the renounced order of life." "Yes," he said as we neared the entrance. "Let's go inside. You'll be doing a program in the outdoor amphitheater tomorrow night. The amphitheater is part of the memorial. 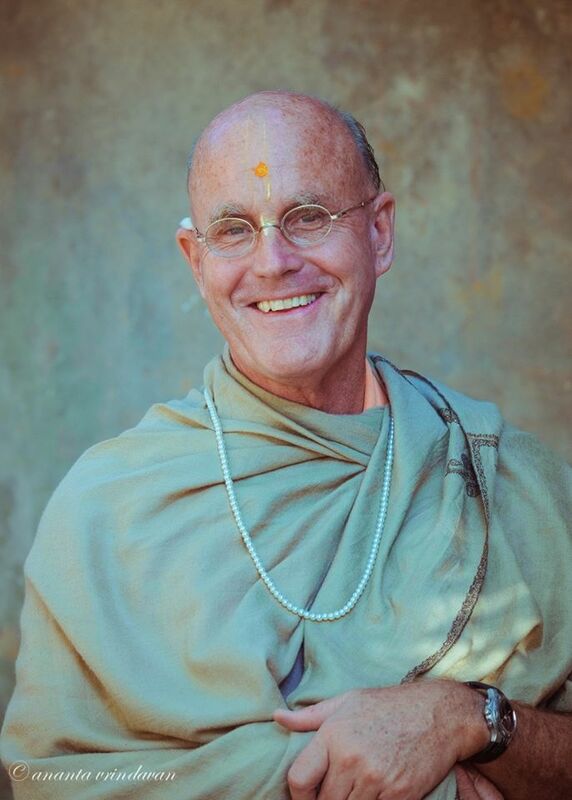 The program is advertised all over town: An Evening with Indradyumna Swami. We're expecting about a hundred and fifty people." "Have any important people, like town officials or other dignitaries, been invited?" I asked. "Well, not that I know of," he said. "We basically just focused on our friends and the public. But who knows? The word is out now." "Maharaja," the devotee said, rousing me from my absorption, "we should get going. The devotees are already doing bhajan in the square." As we hurried to where the devotees were singing, I noticed a large crowd around them. It reminded me of our public kirtans in Poland in the early 1990s. Upon reaching the devotees I was again overwhelmed by the beauty of the music and the singing. I stood quietly for several minutes listening and then spoke to the devotee with me. "I think all of you must have been Gandharvas in your last life," I said. "Lord Caitanya sent you here to liberate these people." I went up to a devotee giving out prasada sweets from a basket. "Would you mind giving me the basket and letting me distribute the prasada?" I asked her. As I gradually made my way to the other side of the square with the basket, I was surprised that not a single person refused the prasada. The sound of the kirtan soon faded into the distance. Small groups of elderly women chatted on benches while their husbands played cards on rustic wooden tables. A number of young couples walked past me, obviously surprised by my bright saffron robes, but everyone was courteous and respectful. In fact, several times after a short discussion people invited me home for dinner. One elderly couple even asked if I needed a place to stay that night. "This is where I want to be," I thought. "It's where I am happiest: distribu-ting Krsna consciousness on the street." I laughed to myself thinking that even the fumes from passing cars were exhilarating, as they reminded me of the years I spent distributing books and doing harinam in cities around the world. After forty-five minutes a devotee came looking for me. "Maharaja" he said, "the devotees would like you to lead bhajan." "In public places I glorify Your mercy, which is granted to even the lowest creature and which enables me, even though I am lowborn, to live in this forest of Vraja, the place where Your great devotees, filled with pure love for You, aspire to take birth even as a blade of grass." The next morning, after a blissful program accentuated by more beautiful bhajans, everyone started preparing for the evening program. Later, as we drove into town, I asked the devotees if there would be security at the amphitheater. Macedonia used to be part of Yugoslavia, and I thought of several incidents of violence I'd encountered years earlier in Croatia and Bosnia. "No need," a devotee said. "We generally don't have problems." When we arrived at 8:00 p.m. the devotees were just starting the bhajan. "Fallen angels," I said to myself, smiling as their melodious kirtan filled the amphitheater and the square beyond. "Who would not be attracted?" Soon the outdoor theater filled with guests. When the bhajan finished I took my seat in front of the crowd. As I was adjusting my microphone and speaking to my translator, I suddenly noticed five heavy-set well-dressed men enter the amphitheater and take up strategic positions around the festival program. Noticing small microphones and wires sticking out from behind their ears, I thought they must be a security team. Looking off to the left, at the entrance to the program, I noticed a smaller man, most likely the head of the team, standing with two guards on either side of him. "I guess it is actually a little dangerous down here," I thought, "but the devotees probably didn't want to alarm me. They must have hired these guys just in case something does happen." phy, even explaining who Krsna is: His name, fame, form, and pastimes. Then I stressed that the philosophy of Krsna consciousness is practical in our modern age. I quoted Srila Prabhupada, who said that we have spiritual solutions to material problems. People would nod when they agreed with a point I was making, especially the chief of the security team. In just short of an hour I finished my talk. I felt embarrassed by the rousing applause. "I only did my duty as a sannyasi," I said to my transla-tor. As I rose to make my way to the book table I noticed the security team moving quickly to the exit. "Why aren't they staying until the end of the program?" I wondered. When I arrived at the book table there was a crowd waiting for me to sign their newly purchased books. Pen in hand, I set about signing the books, as well as writing a few words of encouragement. Suddenly a breathless devotee ran up to me. "Maharaja!" he said. "Wasn't that amazing! It's just incredible! I can't believe it." "You didn't see?" he said. "The prime minister of our country attended your lecture. He arrived just as you began and stood at the entrance with guards on either side of him. He stayed to the very end of your talk." "I saw the security," I said, "but I didn't know the prime minister was here. That certainly is the icing on the cake of a wonderful visit to Macedonia." "There's also the cherry on top of the icing," said the devotee with a big smile. "And what could that possibly be?" I said. "The Prime Minister sent a message with his secretary saying that he loved your talk." I shook my head. "Lord Caitanya's mercy has no limits," I thought. "The Krsna consciousness movement is spreading all over the world simply by describing Krsna. We have published many books, including Sri Caitanya-caritamrta in seventeen volumes, four hundred pages each, as well as Bhagavad-gita and The Nectar of Devotion. We are also publishing Srimad-Bhagavatam in sixty volumes. Wherever a speaker holds discourses from these books and an audience hears him, this will create a good and auspicious situation. Therefore the preaching of Krsna consciousness must be done very carefully by the members of the Krsna consciousness movement, especially the sannyasis. This will create an auspicious atmosphere."